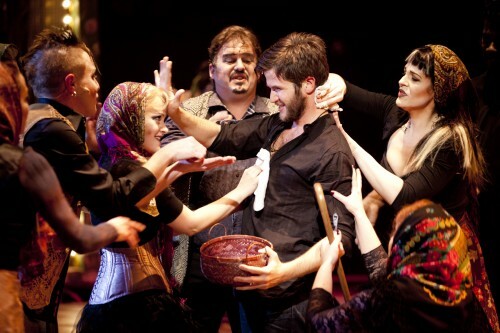 Grigori (Doug Kreeger, holding basket) is happily greeted by a group of strangers for his healing powers. Pictured left to right: Stephen Gregory Smith, Erin Driscoll, Russell Sunday, Rachel Zampelli. Signature Theater’s Brother Russia is a pleasant enough musical, combining a talented cast, some catchy songs, and beautiful and clever staging. But the end result of turning the corrupt Mad Monk into a (sort of) redemptive and (very vaguely) redeemed mystic figure is odd and unsatisfying. It’s not the oddest use ever of Grigori Rasputin by a long shot, but the story doesn’t live up to the music and the production. Brother Russia is framed as a more-or-less contemporary story of a decrepit Russian traveling theater/carnival who are themselves telling the story of Rasputin. Or Rasputin’s story as their troop leader claims it happened, which he’d know if indeed he himself is Grigori Rasputin as he claims. Confused yet? It’s less convoluted as acted out upon the stage… within the stage… but the story’s attempt to tell a wild fable and justify it as a modified oral history is undercut by its own staging. Certain choices near the end make a firm assertion that the story, impossible as it is, is literal truth. There’s even a twist/connection that a late-career M. Night Shyamalan might come up with. A fourth-rate Russian theater troupe welcomes their audience in the world premiere of “Brother Russia”. It’s a pity the story doesn’t gel because everything else is well done. I’m not a huge fan of the rock musical style, having been weaned on traditional show tunes, but it’s well integrated with the style of the production and several songs demand to be hummed for hours afterwards – the opening and closing “Brother Russia Presents” in particular. If you ever sat back and thought “Oklahoma and My Fair Lady? C’mon Arena, you couldn’t get Jesus Christ Superstar?” then Brother Russia is right up your musical alley. The cast does a nice job with the iffy story as well, in particular Natascia Diaz as Sofya as Anastasia. Playing shy and restrained in the midst of this many big characters and bold conflict is a harder job than she makes it look. Dorothy Parker once wrote a review saying “this is not a novel to be tossed aside lightly. It should be thrown with great force.” It’s a fun quip, but it obscures the fact that loathing is a more impassioned response to art than an indifferent shrug towards a merely adequate effort. Unfortunately nobody will be gathering memorable quotes from Brother Russia reviews, including from this one. Signature Theatre’s production of Brother Russia performs through April 15 at 4200 Campbell Ave Arlington, VA 22206. Closest Metro stop: Pentagon City (Blue/Yellow lines). For more information call 703 820 9771. This is a show not to be missed. Filled with all kinds of great musice, talent galore, wonder set, costumes and a great story. I’m sorry, but I just have to ask… is the tattoo on Rachel Zampelli’s neck real, and, if so, what does it say/mean??? Pictures of her in other productions don’t show the tattoo, so maybe it was just make-up for this musical. Inquiring minds want to know! My wife and I enjoyed the show, and enjoyed saying hello to Natascia Diaz afterwards in Samuel Beckett’s. She was very gracious. 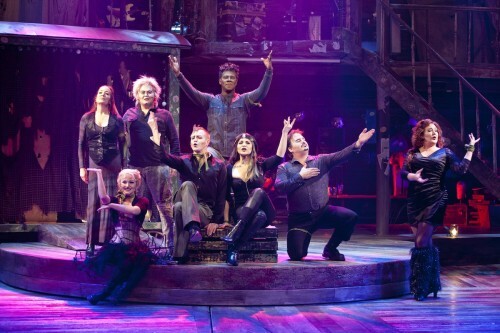 With so much talent on stage it is impossible to dismiss this musical!